The break-in happened last night (Saturday, July 2) when the residents were out of town and unfortunately one of their cats (Spencer) is missing. 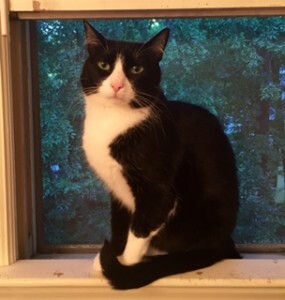 He is a sweet black and white boy, but he may be skittish, as he is an indoor-only cat. If you catch or spot him, please call 919-698-2136. We are keeping an eye out. So sorry this happened to you, but happy that Spencer is back home!